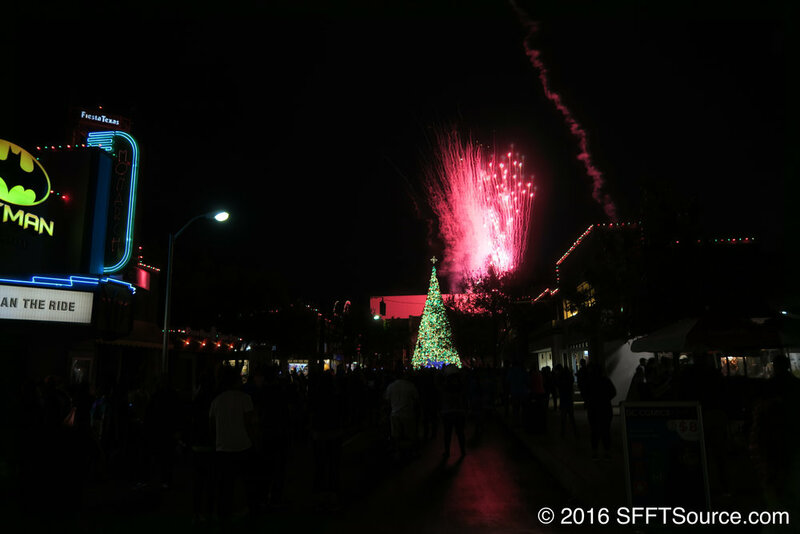 Six Flags Fiesta Texas provides a line-up of holiday-driven entertainment that is free with your admission into the park. The Heart of the Holidays is a NEW show coming to Holiday in the Park this season! Located in Rockville High School, this production features many current and classic holiday hits, including "Keep Christmas With You,"The Man With the Bag," and more. Join Santa Claus at Rockville High School as he kicks off a celebration to light the Rockville Christmas tree. This spectacle contains singing, lighting effects as well as a fireworks display and snow. The Looney Tunes characters return to Sangerfest Halle Stage for a great Christmas production. Guests can enjoy a meal from Sangerfest Halle while watching this show. The spectacle returns to Zaragoza Theatre as The Majesty of Christmas takes guests on a journey through the birth and story of Jesus Christ. This show includes flying characters and live animals. The Tinseltones is a great a cappella twist on many current and classic holiday songs. This outdoor show takes place at the Rockville Christmas tree outside of Rockville High School. Entertainment options don't stop inside the theatres. Fiesta Texas also features tons of great special effects entertainment around the park. Located right in front of Lone Star Lil's Amphitheater is the H2Ho Ho Ho holiday fountain show. Beginning at 6pm each evening enjoy a specialized fountain show featuring lighting and holiday music. Head to the quarry wall in Crackaxle Canyon for holiday-themed projection effects. Holiday Falls is presented nightly during Holiday in the Park. After the Christmas tree lighting ceremony, the Rockville Christmas tree transforms into a light show spectacle to many popular Christmas tunes. This presentation plays throughout the evening. The Singing Saps, located next to Studio 6F, are an animated set of decorated trees that sing many classic holiday tunes throughout each evening. Venture out to the border of Spassburg and Crackaxle Canyon as the foliage pathway tunnel features a spectacular array of Christmas lights. The park features holiday activities that are great for younger guests and families alike. Head to Texas State Square in Los Festivales for a BRAND NEW photo opportunity during Holiday in the Park. Enjoy entering a huge ornament adorned with a twinkling lights all around. 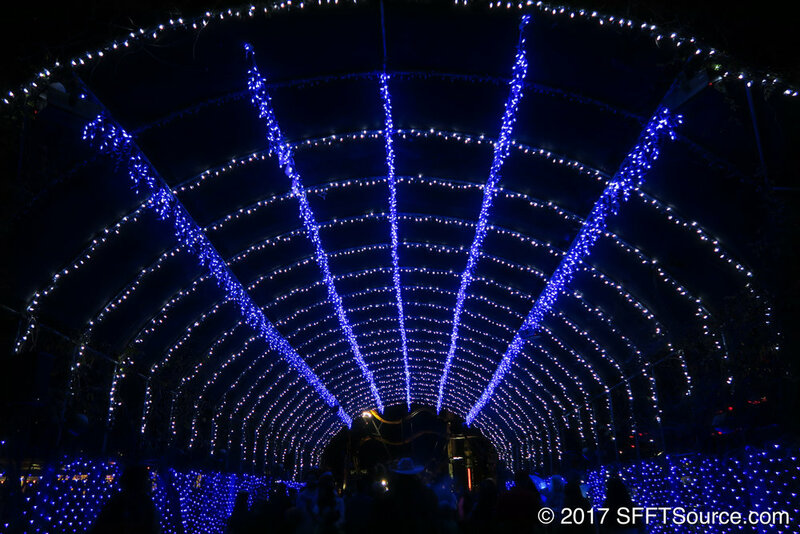 The railroad of Fiesta Texas is transformed into a holiday-themed excursion through many themed, lit scenes throughout your journey. Boarding takes place at Whistle Stop in Crackaxle Canyon. Check out the streets of Rockville as they are lined with tons of Christmas lighting and other holiday decor. Younger guests can take a journey to Santa's Cottage in Crackaxle Canyon to meet the jolly guy himself, Mrs. Claus, the elves, and more. Guests will also have a chance to check out Santa's library full of letters, the cookie kitchen, and toy workshop. Located near Bubba's River Cafe. Specialty food items served during Holiday in the Park at Six Flags Fiesta Texas. All food items are also on the Dining Pass. Large fries topped with cheese, bacon, and ranch. A full interactive map showing locations of Holiday in the Park entertainment and activities. Important tips and information to help you get the most out of your visit to Holiday in the Park. When is Holiday in the Park open? Holiday in the Park is open select dates from November 17 through January 6. Six Flags Fiesta Texas’ official website keeps an up-to-date operating calendar. You can view this by clicking HERE. Fiesta Texas features a handful of holiday-themed shows during Holiday in the Park. A brand new show, The Heart of the Holidays, will be premiering in Rockville High School this year and you won’t want to miss it! Another fan-favorite, The Majesty of Christmas, will also be returning to Zaragoza Theatre. Please note that holiday shows are incredibly popular and we recommend you arrive that venues 30 minutes prior to show time. More information, including show times, are found below. Please note that some holiday entertainment may end at Christmas while some shows will proceed through the first week of January. More information can be found by clicking on the “Entertainment” tab above. Beyond live entertainment, the park has many other great holiday activities, including Santa’s Cottage where guests can pay a special visit to Santa Claus. At the crossing of Crackaxle Canyon and Spassburg is both Winter Wonderland and Holiday Falls. These are light and projection attractions that will play throughout the evening once the sun goes down. Guests can also hop aboard the Holiday Express at Whistle Stop for a great train ride experience. Please note that some of these attractions end at Christmas while some proceed into the first week of January. Click the “Holiday Activities” tab above for more information. Past and present image galleries and videos related to Holiday in the Park at Six Flags Fiesta Texas.